Drawing on 2013 UNESCO data as well as updated figures from the French government, a new Campus France study provides an overview of African student mobility. 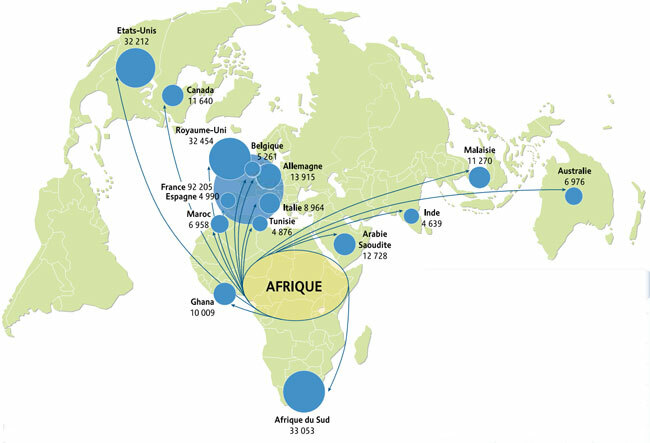 La mobilité internationale des étudiants africains finds that just over 373,000 African students studied abroad in 2013. This represented about 10% of all internationally mobile students worldwide in that year, but, in absolute terms, also reflects a decline from the recent-year high of more than 412,000 students in 2011 (a 9.5% drop between 2011 and 2013). Overall, global mobility has continued to increase this decade so one net result here is that the representation of African students in the worldwide total has declined somewhat over the past decade or so, from 13.7% in 2003 to 10.6% in 2011. Even so, Campus France, the French government agency with responsibility for promoting France as a study destination, notes that the student mobility rate in Sub-Saharan Africa remains roughly double that of the world average. Looked at another way, the declining global share for Africa noted above is more a function of relatively rapid growth in other global sending regions than anything else as overall African outbound numbers have continued to grow over this period. Beyond these broad indicators, the report is careful to note that there are considerable variations in mobility throughout the continent. Just over one in five mobile African students (21%) come from the Maghreb, a regional group of Northern and West African nations that traditionally includes Morocco, Algeria, Tunisia, and Libya. Adding in Nigeria, Cameroon, Zimbabwe, and Kenya accounts for half of all international students from Africa. Within this grouping, Morocco and Nigeria are some of the biggest senders. Each has sent as many as 45,000-50,000 students abroad in recent years, but somewhere between 2010 and 2012 Nigerian outbound mobility surpasses that of Morocco. Nigerian mobility has of course since been disrupted by the collapse in world oil prices and resulting foreign exchange controls. Even so, its fundamentals as a sending market remain strong and many observers continue to categorise Nigeria as one of the world’s most important emerging markets for international education. The following tables provide a summary of the top African sending markets, with the top gaining and declining markets for the period between 2010 and 2013 highlighted as well. The tables certainly reflect some volatility within individual markets. Along with notable gains for Nigeria, we see significant near-term declines in Zimbabwe, Namibia, and Botswana. Outbound flows from African countries have traditionally been quite concentrated, and this remains the case today with just three destinations – France, the UK, and South Africa – attracting nearly half (45%) of all outbound students. However, those three leading destinations had an even greater share in 2012 (54% of all outbound students), and the report describes a shifting pattern of African mobility with declining percentages of students heading for traditional European destinations in favour of international study options in the Middle East and within Africa itself. As the following illustration shows, France is far and away the leading European destination for African students, with the US and the UK as other preferred destinations outside the continent. Within Africa, South Africa is the clear leader, followed by Ghana and Morocco. The broad pattern here is of a declining share of African sending markets for Europe, a stable share for North America, and an increasing share for the Middle East, driven in part by expanded scholarship support at Islamic universities. Campus France also observes a growing percentage of internationally mobile students who, while studying outside of their home countries, opt to remain within the continent. The report finds that nearly one in five mobile students (19.9%) from Africa studied in another African country in 2013, up from 14.7% in 2012. Even with that impressive growth, there are some indications that the actual levels of mobility within Africa are even higher than UNESCO statistics would indicate. France’s leading position among destination countries points to the important role of language in shaping the international mobility of African students. More than half (54%) of mobile African students are from countries where French is commonly spoken, and a comparable number (45%) come from markets where English is widely used. Not surprisingly, students’ choice of study destinations is strongly correlated to language background, with France the leading choice for French-speaking students and the US, UK, and South Africa the top English-speaking destinations for African students. The shifting patterns of African mobility, particularly to greater movement within the continent, will especially draw the notice of international educators in France. Africa accounts for more than four in ten foreign students in France (43%), and, as we have reported previously, France has lost global market share in recent years as the growth of its international enrolment has not kept pace with that of other major study destinations. This entry was posted in Africa, Regions, Research and tagged education abroad, student recruitment, undergraduate admissions, Uganda, student mobility.